It was quite a feat to pull off this amazing event in Cairo, my first event organizing experience in Egypt. With the help of Usef Salah behind-the-scenes, the collaboration of Tahrir Lounge, our host space, and the assistance of my wonderful team – it was a major success! Below is a photo I snapped of the crowd. Nearly one year ago, the unprecedented 18-day occupation of Cairo’s Tahrir Square — which led to the fall of autocrat Hosni Mubarak — has become a global symbol for citizen activism and peaceful dissidence against despotism. As the first anniversary of the January 25 uprising approaches, Egypt continues to evolve the culture of dissent as activists and revolutionaries enter the media battleground, armed with digital technology and an ever-growing community of citizen journalists. This past Thursday, in downtown’s Tahrir Lounge at the Goethe Institute, cultural activists, filmmakers and citizens of the revolution were invited to celebrate the launch of a collaborative documentary website, “18 Days in Egypt” — the latest bludgeon against state media in the war of propaganda. “18 Days in Egypt” began with a vision from documentary filmmaker, Jigar Mehta and creative technologist Yasmin Elayat, to create a crowd-sourced documentary of the January 25 uprising. “Throughout the 18 days of the January  uprising — in the year since, through now — Egyptians have been filming critical moments and events on their mobile phones, tweeting, texting, taking pictures and videos on their path to freedom,” Elayat told Daily News Egypt. In order to develop the website, Elayat and Mehta teamed up with Emerge Technology to create a new web-technological platform called GroupStream — the storytelling springboard empowers citizen journalists, photographers, filmmakers and the culturally active with the ability to upload tweets, pictures and videos into a storyline. When the content is uploaded, users can then tag the location, contributors and the date, helping to create clear interactive, visual timelines of events. “Essentially, we wanted to build a platform for people to tell their story,” Elayat added. “We wanted to give more power to the people, without interfering, to put their stories together the way they remember them. The problem with many of the YouTube videos [of the revolution] is that they have no context, making them confusing to the viewer. Our tools provide a means around that. Although the film-project has received funding from the Tribeca New Media Fund and acceptance into the Sundance New Frontier Lab, the collective documentary has become a secondary objective for the co-creators. Instead, they foresee the technology becoming an active tool in organizing and generating their media, while the film will eventually create itself. Guests who attended the launch party on Thursday were privy to a projected demonstration of how to use the site, and were invited to begin uploading content and creating their own streams. 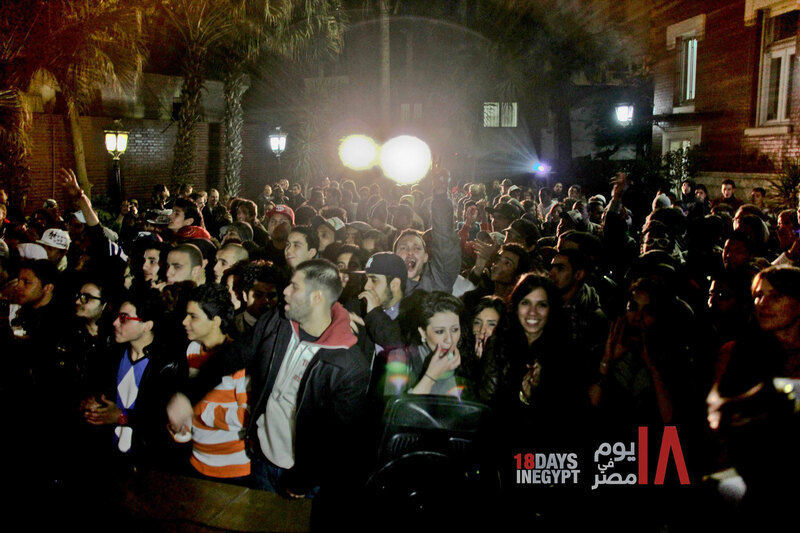 Shortly following the presentation, the stone courtyard of the Tahrir Lounge was transformed into what felt like a political concert of sorts with combative performances by local rap group Arabian Knightz, singer Ramy Essam and MC Amin. The event attracted close to 400 guests including several handfuls of Ultras fans who welcomed the performers with their signature entrance of beat-boxing and collectively chanting, “Arab hip-hop, Arab hip-hop,” rallying the audience to engage with the performances. Karim Adel (aka Rush) from Arabian Knightz said, “These types of initiatives are extremely important considering the fact that state media is continually lying. We need a media that’s going to document the truth. “Internet is the number one enemy of these archaic governments. As we have seen, it is a very important tool that can be used to topple dictatorships,” he added. As “18 Days in Egypt” has more of an artistic approach and desired output, it joins the ranks of other new-age media projects mushrooming around town including Mosireen and the anti-propaganda campaign “Askar Kazeboon” (Lying Officer). The latter uses portable equipment to create pop-up screenings through Egypt, relying on raw footage from the Mosireen archive system, to expose the brute and excess violence used by the Supreme Council of the Armed Forces and Central Security. The struggle for freedom and independence is an ongoing human battle, and with state media’s constant concessions to actively vilify the protest movement, alternative media and resistance activities are the most effective form of political action available to the Egyptian people at the moment. “The Egyptian revolution has exhibited the most innovative use of what technology has to offer,” Elayat said. “I don’t think any other country in the world has been this innovative. This is the future, we are one step ahead. We can dictate our history using technology, not just through spreading the message but also through documenting for the future. Our personal technology in the 21st Century — our mobile phone cameras, laptops and networking sites — changed the paradigms of dissent by giving the people an apparatus to combat state-driven propaganda. On the road to democracy, the state ought not to have the right to determine historical truths, and with local textbooks already being amended to re-write history, initiatives like “18 Days in Egypt” are defending the right to expression by pushing the limits of the system and once again, evolving the art of protest. For more information about the project, visit http://beta.18daysinegypt.com.